Launching BJP's election campaign for Maharashtra, Modi turned the comment made by a Congress leader into his advantage. Prime Minister Narendra Modi on Monday said that he was “proud” to be a “chowkidar of toilets”, as he took the Congress’ abuse as an “ornament”. Referring to a Congress leader’s reported comments comparing him with a chowkidar of toilets, Modi attempted to grab advantage by claiming he was “a guardian of the dignity and self-respect of millions of women” who faced huge embarrassment in the absence of toilets in their homes. 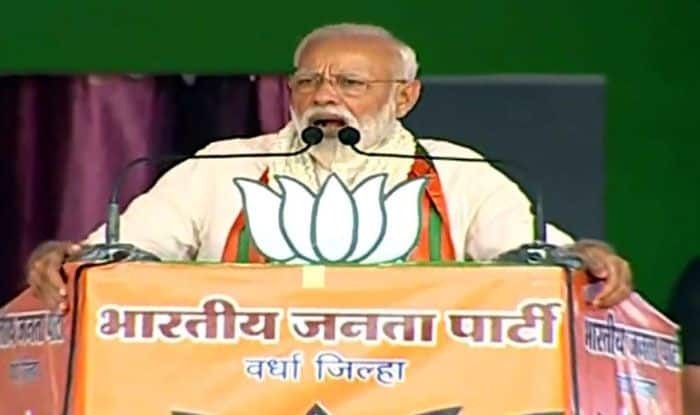 “I am proud and happy to be the custodian of the ‘izzat’ of crores of women who have to run out before sunrise or wait till sunset for their ablutions,” Modi said Wardha as he launched the BJP’s election campaign for Maharashtra. “By insulting me, the Congress has insulted the sanitation workers who toil since decades to keep toilets clean. It may be a laughing matter for them, but I am absolutely serious about it,” he stated. Modi said he was honoured to step on the holy soil of Wardha graced by Mahatma Gandhi, Acharya Vinoba Bhave, Baba Amte and others. Present on the occasion were Chief Minister Devendra Fadnavis, Union Ministers Nitin Gadkari, Ramdas Athawale and BJP Lok Sabha candidates from the Vidarbha region of eastern Maharashtra.